Here is what I was looking at doing. 2. The save will check for overlapping dates and/or times. 3. The save could (if possible) validate pre-blocked times for either allowing entries or disallowing entries. When a user attempts to create a new entry, the “booking” layer is evaluated to see if this new entry violates any of the currently exisiting rules. If it does, a notice is displayed. Next, the new entry will be evaluated if it violates any currently exisiting entries. If it does, a notice will be displayed. I have made a solution that lets you set the time period of each week day that a resource (like a meeting room) can be booked. This is done by specifying a choice field (Meeting room) in the setup of this solution, and to add records in the settings list for each selection in the choice field (like Meeting room 1 or Meeting room 2). This solution will ensure the room can be booked in the available time period only, and will also prevent users from double booking the resource by checking for overlapping time periods before saving the new or edited record. The user will be presented with informative messages regarding time period or dates out of range, and/or double bookings so they can correct their input before attempting another save. This solution is designed for both SharePoint 2007 and SharePoint 2010. Upload “spjs_utility.js”, “SPJS-ResourceManagement.js”, jQuery and jQueryUI (if you prefer a local copy), to a shared document library, or a folder created in SharePoint Designer. Ensure all user have read access to the location where you put the files. Change the variables in the top of the CEWP code, and the script src to jQuery, jqueryUI, the jQueryUI css file, “spjs-utility.js” and “SPJS-ResourceManagement.js” to reflect your local copies. Upload the CEWP code as a txt file to the same location as the other files. Add a CEWP below the form web part in NewForm.aspx / EditForm.aspx and use the “content link option” to link to the CEWP code you uploaded in the previous step. You may also use the HTML form web part and put the CEWP code in the “source editor” directly. Enter edit mode by clicking the © below the form in NewForm.aspx. You may supply a password in the GUI to prevent user from editing the settings. You will never have to hand edit the configuration list, but you find it under “All Site Content” of the site you specify as “SPJSRM_settingsListBaseUrl” in the CEWP code. There are also a chunk of HTML code that must be included. You find the complete code in the download referred above. SPJSRM_settingsListBaseUrl: This is the base url of the settings list. Use “L_Menu_BaseUrl” to refer the current site, or supply another baseUrl to place the configuration list in another site – use “” to refer the root site. timeFormat: Use 12 for 12 Hour format or 24 for 24 Hour. Only cosmetics regarding the time as displayed in validation messages. Alexander, I have been thinking about a solution like this for a while, but here is my major concern: what if two people try booking the room at the same time? I am afraid they’ll both see the room available, and it’ll result in double booking. ok, I understand. I assumed the availability check was done when the user selected the dates. Did you get the prompt to create the configuration list? I am currently developing a SP 2007 calendar as a employee time tracker. PTO, sick time, working from home that sort of thing. I was wondering ifi this idea could be adapted to check if the requester has any list items on the same list that overlap, that way if someone has a day set an all day event for a work at home day, then they go to try to put in a new entry for the same day as a sick day, they would get the overlap error? I see your solution valuable but unfortunately our people have so gotten used to reserving meetings using Outlook: They can add the meeting request for a bunch of ppl and just add the meeting room as one person in the list. This is very fast and no additional step of adding the meeting room request in SharePoint is needed. For people accustomed to this approach – do you think it would be possible to somehow use jQuery to show combined shared meeting room mailboxes from Exchange servers in SharePoint? Sorry, but I cannot help you with outlook integration. I am experiencing the same issue as Kris with regards to the UK date settings. Hi Alexander, I have changed the settings back to L_Menu_BaseUrl and removed the quotes and still works so do not know what I did wrong before. The format dd/mm/yy or dd/mm/yyyy does not work. I have fixed a bug in the date format validation – see v1.1. I have found a bug where if a room is booked as a recurring event it will not allow another booking until the last recurrence. Hi, I’ll try to fix this in the next release. I cannot tell when this will be as I’m a bit overloaded at the moment. Sorry for the late reply, but I have not been able to fix this issue without having to put in *to much* time. As this solutions stands, you can not have recurring events. Sorry. As of March 2014, is this solution now able to accomodate re-occuring events? Sorry, This is not possible. I have not had the time to modify the solution. You have come up with some really great SharePoint solutions. I just started using DFFS, and I was wondering if you’ve come up with a solution for recurring meetings as of 7/30/14. Sorry, but I have not had the time to look at this. I’m not sure I actually will be able to add this in, but It may happen later on. Hi Alexander. Another great solution, thanks!. One quick question – if a resource is booked say from 10am to 11, the script will not allow the resource to then be booked from 11 to 12 as it classes this as an overlap. 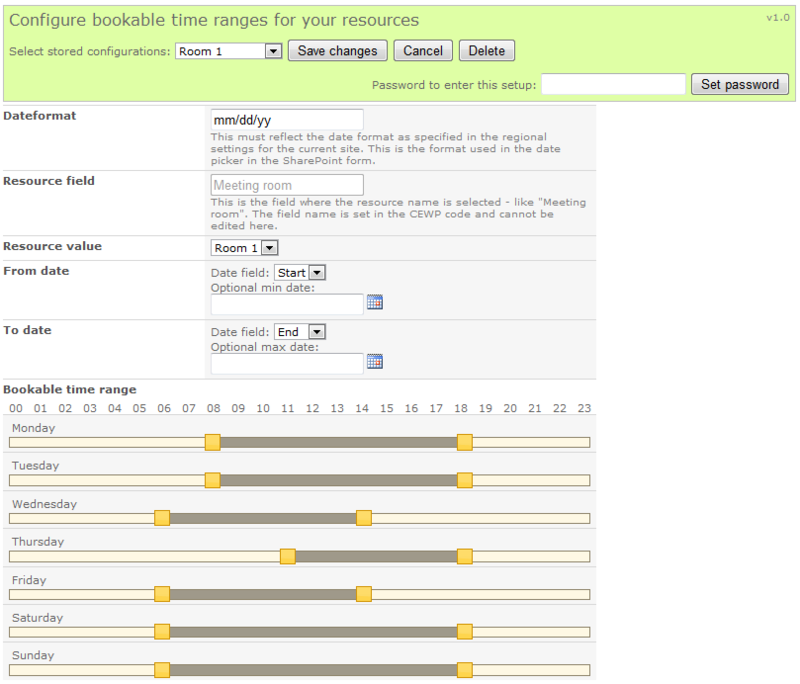 Is there a quick tweak I can make to the SPJS-resourceManagement.js to allow resources to be booked consecutively? I have just started following your solutions and I must say they are impressive, but my biggest issue at this point is the fact that i do not get any prompt for the SPJS Resource Management config list creation. I have followed all steps but i still get a blank page. I have referenced the .js and the css files. I have set this SPJSRM_listName to my list name. Thank you for the script, I have it working for several areas already. I have one question which could throw a monkey wrench in there. Can the script accomidate minutes? I have a few offices that would like to use the script but their appointment time ranges are sometimes less than hourly blocks. Is there am approved method to accomidate this? Would I need to modify a portion of the script? Mine automatically allowed appointments to be scheduled in 5 minute increments – just like the default calendars in Sharepoint. No modification needed – use the “time picker” part of the date picker to set the time. I’ll look into the problem with consecutive booking, but until then, you must book the next “meeting” five minutes later for the script to sees the time as available. Great script! Thanks very much for sharing. Thanks for the suggestion, Cory. Unfortunately, when I change the variables within the qb.push statement, it no longer prevents double-booking. I’m not sure how the end or start variables are stored, so I don’t know if the get and setMinutes methods are correct. I was going to experiment here shortly..
Incidentally, it should read: start.getMinutes() which hopefully you caught. Please test v1.2 to see if the problem with consecutive booking is fixed. Thank you so much for all your work! v1.2 works when booking the next time slot available; however, if you try to book the one before a currently booked time, it gives the error. For example, I booked a room from 2pm-3pm and could book the room after from 3pm-4pm. But, when I tried to book the room from 1pm-2pm it gave the overlap error. This will work for me for now, but I will need to fix that in the future. I can’t tell yet what modifications you made, but will keep looking. Thanks again for sharing all of this! Thank you for testing it – I did obviously not think this trough. Look at v1.3 and I believe the consecutive booking problem should be fixed. The “magic” happens around line 508. This works as long as I didn’t change the original CEWP code. I saw that you had added a new version of that in v1.3 so replaced both pages first. After doing that, the double booking didn’t work at all anymore. When I changed the CEWP code back to the original, everything worked great! No more issues with consecutive appointments. I changed ‘yy’ to ‘yyyy’ on lines 454 and 501 of your 1.3 version of SPJS-Resource-management.js though and it now works perfectly. Thought I’d flag up in case anyone else was not getting 1.3 to work as expected who have a similar date format on their installations. Does this solution work with recurring events? Everything looks to be working fine but when I try to create a recurring event I receive the following javascrip error ” ‘fullDate’ is null or not an object”…Anyone having a similar issue? Thanks for your work on this project it has been very helpful! I do not think this will work with recurring events. The CAML has to be modified to support this. I might be able to add this to a future release, but at the moment I’, fairly sure it won’t work. thanks for the replay Alexander. The reason I thought it worked was because there was a comment from Andrew talking about recurring events. Maybe I am misreading if he is really using recurring events. A future release with recurrence would be awesome. Thanks again, cheers. I sent you a beer too. Thanks for the help…I am the one who sent it now, my name will appear different under PayPal. thanks! I have this working with a Choice field type, but I can’t get this working with Content Types. Are there any known issues/work arounds to get this working with content types? Sorry for the late reply, but it’s not possible in this version. Alexander, you are absolutely the BEST! I have to do so much with so little, and your codes have saved me! I couldn’t get our organization to install the room reservations template for me, so I finally had to just create a simple calendar. Of course, my boss wanted a way to not double-book and your code worked flawlessly! I owe you at least three dozen beers for the phenomenal coding you do! “MeetingRoom” is the FieldInternalName for the meeting room selector in the form. Yes I have checked that one too. Is the form standard SharePoint, or has it been modified in SharePoint Designer? Its my bad.. i was trying all this in a normal Task List. when i implemented the scripts in a Calendar list, it was working cool. Place the CEWP below the main calendar web part, the above error should go off. error even after changing ‘yy’ to ‘yyyy’ on lines 454 and 501 of your 1.3 version of SPJS-Resource-management.js code as commented earlier. Any idea why I keep on getting this error when configuring and click on ‘Creat eNew’ button? Hard to tell, but try upgrading the spjs-utility.js to the latest version. I ran into this as well, and I was able to make it work by using the Content Link Option instead of copying and pasting the code in the CEWP html. Hi Alexander I’m so hoping you can help. I’ve deployed your solution and it works great except I have a problem when I have a clash. Whilst the action is stopped and no post back is made, I don’t get the error message to tell me who has already booked the room. I’m sadly having to use IE 6 due to the company I work for, but I’m hoping its something I’ve perhaps missed. When I debug in explorer I just get Error: ‘dare[…]’ is null or not an object. Still having problems, or have you figured it out? I am getting the same error. Any ideas on what it might be? Sorry, no. Its nearly impossible without more info, or possibly reference to a line number in the code where the error occurs. Thank you for posting this wonderful solution. I have noticed that when I am testing it (with your latest build) – the solution is displaying 12PM as 12AM for some reason. Have you heard of this occuring, any fix for it? Hi, It’s most likely a bug where I have mixed AM with PM. I’m not that familiar with the AM/PM format as we use military time in Norway. I’ll look at it when I come home from my holiday. Thank you Alexandar. I hope you are having a good holiday. I’m new to your blog – hope to learn a lot here reading through many of your articles. Thanks for being an active educator in the SharePoint community. It is much appreciated and fantastic material. This solution looks wonderful. though I am having trouble getting values to appear in the ‘Resource Value’ field. I have set choice values for the choice field that I am using but nothing appears when in the ‘Resource’ field when I click ‘Edit Settings’ on the copyright symbol. Hi Daniel, how do u allow values to appear in the resource value field? i need help on this thanks. Nice work, is it possible to get data from external datasource which will be checked for double booking? Hi Alexander I’m hope you can help me. I used your solution and works fine but I have a strange bug. I want to book resource from 3.4.2013 to 4.4.2013 and your script says that is already booked by a user from 25.03.2013 to 27.03.2013 !!!! Could be the problem is the date format??? Do you know if there is a way to add a CEWP on a NewForm for a Calendar on SP2007 without using SharePoint Designer? ToolPaneView=2 works but doesn’t give me the option to add CEWP. I Install your script but i don´t get it run. I got the following error if i press at edit Settings. The value MR specified in the variable “SPJSRM_resourceFieldInternalName” in the CEWP code cannot be found. The field MR is set at the list. The forms (newform and editforms are modified with the tool Nintex. Could you help me to get it run. Sorry, but this solution is designed for unmodified “out of the box” forms only. Apologies Alexander, I must have been on crack the day I poseted that code, please remove it as its wrong. I finally got a chance to take a look at my changes, I traced it with Firebug again today and noticed the dates in the query were wrong so switched back to your code and the same thing happened. It turned out we hadnt changed the date format in the settings from mm/dd/yyyy to dd/mm/yy so the dates were coming out rather skewed. All is now working correctly with your code as it was. That’s OK, I have removed our conversation above. I wanted to test it out but I tried to download the CEWP code, however it seems the download link is not working. I was able to download the .js file, however when clicking on the CEWP, page loads with an error. Try right click – “save target as”. The value “Facilities” specified in the variable “SPJSRM_ResourceFieldInternalName” in the CEWP code cannot be found. Either the field has not been added to the content type, or the field does not exist. Please help to solve this. This would mean that you have the wrong fieldinternalname for the field “Facilities”. Follow the link in the article to learn how to find the fieldinternalname. I have follow your instruction to find the “FieldInternalName”. But I still got the error. 1. SPJSRM_listName –> Use GUID from the calendar? 2. SPJSRM_resourceFieldInternalName –> What type must be user for this column? Choice Column? Lookup Column? 2. Upload CWEP code.txt, SPJS-ResourceManagement.js, spjs-utility.js to my Shared Document at root site. 5. 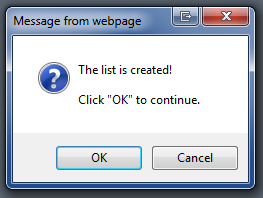 Created List SPJS Resource Management for the first time. I still got the same error as before. I love this solution, however would like to check with you on how could i change the checking condition for the room names such that it does not need to completely match the full room name. I’ve gotten to the ‘Edit Settings’ screen, and everything appears to populate correctly, but it is not clear how I create configurations. I click on ‘Create New’ and get a “[doSaveSetting] null” error message. Where are the new configurations created? Alexander – this is a great resource! I’m almost there: I’ve been able to get the script to work, although I’m getting an error when creating new items: in the Start Date field I get this error: “End time cannot be less than or equal to start time”, even though the dates and times are valid. I’m using the latest spjs-utility v 1.172, Resource Management v1.3. I’m not sure if others have had similar issues. Feeling a bit stupid… user error – I didn’t set the configuration for “From date” and “To date”, so the defaults don’t work! Suggestion: having the default config values select “Start Time” and “End Time”, respectively may reduce some user error (or was that just me!). Hello Alex. Thanks for the great work that you’ve done on this. I have a requirement for this to work on SharePoint 2013. Would the same settings and scenario work. I have not tested this in SP2013 and cannot tell whether it will work or not. Have you tested it now? I’ve tried it, but it does not work. Is there a video in youtube or somewhere regarding the steps in this solution ? You should use that one instead. i couldn’t quite figure out where to start from . 1> created a calendar : calendar1 . add choice column: to ‘MeetingRoom’ to the same with choices . a> change the reference locations for the css and js files to location on your server. 6> Tried creating and editting meeting room bookings . nothing extra happens.Feeling super tired. Wish there was a video . Will make 1 if i succeed.Dont know what wrong. You should use the latest version I linked to in the previous reply. Bring up the developer console (hit F12 > Console) – any errors? No errors on going through F12 . in CEWP.txt we have the function : init_SPJSRMSettings(true) . Where is that function located ? which js file. Didnt find any place yet. I figured that the init_SPJSRMSettings function is in the “SPJS-ResourceManagement.js” file and not in the spjsrm_min.js file.Correct me if wrong. This is compatible with SP2007 and can be used standalone, without DFFS if this is what you want.